My kids and I love to read, and love to play pretend. Playing pretend with the stories was a great way to check to the kiddos comprehension. 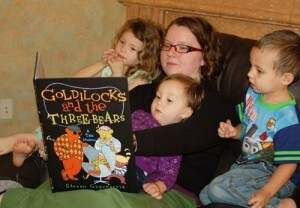 Our recent reading dramatization was with the adaptation of Goldilocks and the Three bears, by Steven Guarnaccia. One of the things I liked about this version is that it was gender-neutral. It discussed the bears by size, not with titles of “Papa” or “Mama”. This made the book great for my younger preschoolers who are learning to differentiate between opposites and to describe things that they interact with. 1) Find a Big Bear, Medium Bear and a Baby-sized Bear. Thankfully, we have a Grammy who has given us a wide assortment of bears to choose from. 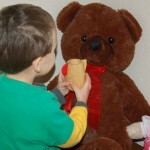 2) Match a bear to a kid. We have a little preschooler, a bigger preschooler and a biggest preschooler. 3) Go on a hunt for the biggest cup (for the porridge), the smallest cup, etc. 4) The book talked about how the Biggest bear’s chair was hard. Which chair in the house is the hardest? How about the softest? The messiest? The cleanest? Which chair is the worst? Which chair is your favorite? etc. 5) We then moved onto beds. 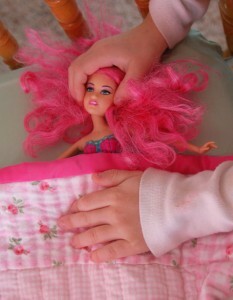 My oldest preschooler had fun having her “Goldilocks” (yes, in our story she has hot pink hair) try out the different beds in the house and describe them to us. 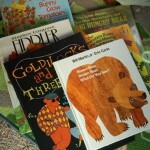 After reading our book about bears we went through our collection of books and picked other books to read about bears. This was such a fun morning activity! Thanks Abram books for a lot of fun exploring differences! Do you have any books that your kids love bringing to life in their imagination? Are you looking for more ways to have fun learning to read? Erin at Letter Soup has a great post with nearly a dozen fun literacy activities. Previous Post: « 1920?s childhood “ SERIOUSLY? It’s been a while since my kids were little but they loved the Skippy Jon Jones series because of the accent and spanish! We had fun bouncing on the bed like Skippy and talking in our best accents! Hopping over from blogfrog! I seriously wish you were around when my kids were little. Maybe our lives wouldn’t have been as boring. HAHA! How creative! I love the way you’re helping your little ones not only love books and reading but also make connections to their own world! came from blogfrog! LOVE the design. 🙂 And GREAT tips and ideas. I love these ideas! They are so doable for my age kid– even though he still struggles with big, bigger, biggest– but it’s something I feel I can expose him too. I love that these activities don’t require a lot of “stuff”. I can’t wait to try them out!! I love your blog! So many great activities and ideas! I have a 4 years old daughter who loves to read, to do crafts, and everything else you have here. I’m sure I will be a frequent visitor!